Shaden Tageldin, “Fénelon’s Gods, al-Ṭahṭāwī’s Jinn: Trans-Mediterranean Fictionalities,” Philological Encounters (January 2017). Jury comment: In a paper that covers ground from the sensation novels of the 1860s to contemporary “puzzle shows” such as Lost, Mecklenburg ingeniously analyzes the rhetoric of the “spoiler alert”: the implicit understanding that certain kinds of serialized narratives can be ruined if certain plot details are divulged. Mecklenburg asks, What exactly is a spoiled reading? What are the origins of this animus against revealing the plot? And what does the assumption that certain kinds of serials can never be re-read say about their genre and the expectations that readers bring to them? These are the kinds of fascinating questions that this essay examines. 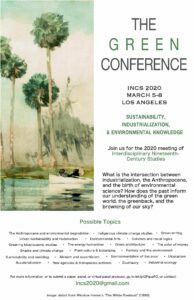 Not only is this paper an elegant engagement with the theme of the 2018 INCS conference, it also opens up opportunities to rethink the rhetoric that surrounds a broad range of texts and narratives, from the Woman in White to Westworld. ANNUAL CONFERENCE: SAVE THE DATE! What is the intersection between industrialization, the Anthropocene, and the birth of environmental science? How does the past inform our understanding of the green world, the greenback, and the browning of our sky?